Earnings are announced every three months. The announcement is always important to the company. Management will provide insights into operations in a conference call with analysts and the analysts will use that information to revise their earnings models for upcoming quarters. That’s one reason we often see a large price move in a stock on the day earnings are announced. Another reason is the fact that the company is providing new information about its operations to the company. Market prices, at least in theory, reflect all of the information that is known about a company. Traders use the information to form their opinion of the company and they act based on those opinions. Quarterly earnings reports require traders to update their opinions and the result can be a volatile day of trading as the information is quickly incorporated into the price. This volatility actually demonstrates that markets work as intended. But, the volatility can also provide a trading opportunity. Some stocks make large moves when earnings are announced. This could be because the market has underestimated the company’s prospects. One example of this pattern is Intel Corporation (Nasdaq: INTC) shown below. Intel has made significant moves on each of the past two earnings reports, a rally of about 10% in January and a gain of nearly 9% on the previous report. Over the past five years, the stock has delivered an average gain of almost 6% in the week after earnings are announced. These are the type of moves traders would expect to find in smaller companies. But, the market seems to consistently underestimate the prospects of Intel. There is near constant speculation about the rise of rivals and slowing demand for processors. Yet, despite that speculation, the reported revenue has been mostly moving higher. The chart below shows reported revenue in each quarter over the past ten years. The chart confirms that revenue does appear to be linked to the business cycle as it did decline during the Great Recession. But, Intel has diversified its product line since then and now supplies chips for many more items that are in everyday use. It remains to be seen but Intel could be producing a staple that defies the business cycle now. In a recession, staples, like soap and laundry detergent, tend to fare well. Chips for use in Facebook and LinkedIn servers could withstand a downturn in the future. That is a long term reason to consider the stock. In the short term, the stock has been volatile on recent positive earnings. Another large move appears likely although the direction is not known. The long strangle involves buying an out of the money call option and an out of the money put option, both with the same expiration date. This strategy can be used when a significant move in a stock is expected. This strategy can benefit from a large move, without requiring the trader to form an opinion on the direction of the trade. Like all options strategies, the long strangle is limited by time because all options have an expiration date. This strategy can be implemented when earnings are due since the date of that event is known. It provides potential gains based simply on the move. The timing of the expected move can be difficult to determine. For many stocks, the strangle could be opened in the days before an earnings report is released. This would be a short term trade and options are well suited to short term trades. INTC is trading near $53 a share. An out of the money call is one that has an exercise price above the current price of the stock. An out of the money put is that has an exercise price below the current price of the stock. For INTC, a strangle can be created by buying a $53 call and a $53 put, both expiring on April 27, the day after earnings are announced. The call is trading at about $1.50 and the put is trading at about $1.50. To open the trade, a total of $300 will be required since each contract covers 100 shares. This example ignores commissions because they should be quite small, just a few dollars, at a deep discount broker. When trading options, it will be important to select a broker that offers very low commission rates. Assuming INTC moves by 6% or more in the next month, this trade will be profitable. If INTC moves 10%, for example, the trade would deliver a gain of about 76%. INTC has moved almost 15% from low to high in the past two weeks and another large move is likely based on option pricing models. A 10% move would be equal to about $5.35. If it is up, the call would be worth about $5.35 and the put would be worthless. If it’s a down move, the put would be worth $5.35 and the call would be worthless. Either way, the gain is about 76% of the amount invested. This return would be for a short term trade. If trades like this could found once a month, the potential gains on the amount of capital required to open a trade would be rather large over the course of a year. The risk of the trade is limited to the amount of money paid to purchase the two options. Even if INTC fails to make a large move, the size of the loss could be smaller than the amount invested assuming one of the options retains some value. 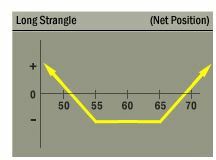 When news points towards potential volatility, the long strangle strategy offers a way to benefit from volatility rather than attempting to make directional calls on trades. This could be appealing to risk averse investors who understand the difficulty of forecasting short term price moves.